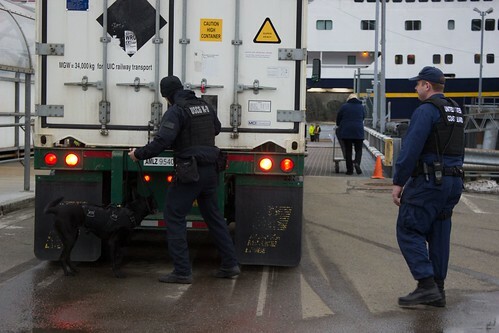 Canine Luna and his handler Petty Officer 1st Class Elliott Felix, a member of Coast Guard Maritime Safety and Security Team Seattle (91101), conduct a sweep of the Alaska Marine Highway System ferry terminal in Ketchikan, Alaska, March 11, 2018. The Coast Guard, Alaska State Troopers and other agencies partnered together during the law enforcement operation to detect and deter illegal activity on Alaska's waterways. U.S. Coast Guard photo by Petty Officer 3rd Class Marissa Gilbert.